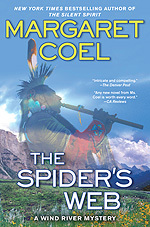 The Spider's Web is your fifteenth novel with Arapaho attorney Vicky Holden and Father John O'Malley. Was it difficult to come up with new things for them to do? Every time I turn on my computer to start a new novel, I feel as if I'm checking in with old friends. I'm eager to find out what they've been up to. Coming up with new ideas for them is easy. I clip news articlesanything about Indian Countryand pull ideas out of the history books. I'll never run out of crimes for them to solve. Where did the idea for The Spider's Web come from? In every novel, several ideas usually come together. I had wanted to work the Arapaho Sun Dance into a novel for some time. The Sun Dance is the tribe's most sacred celebration, held on the Wind River Reservation over a week in July, and Arapahos come from across the country. As many as two thousand people camp in white tipis on the Sun Dance grounds. Drums pound day and night. The dancers who pledge to do the three-day dance as a prayer offering for the people spend a full year learning the rituals, prayers and songs. They also must prepare physically, since the dance itself is an ordeal. No food and no liquids for three days! And this is central Wyoming, wide-open prairie country, with lots of sunshine and little shade. It can be very hot. When they are not dancing, they spend the time in sleepless vigils, praying. The atmosphere is peaceful and prayerful, really beautiful. This summer 150 men and women pledged the dance. In The Spider's Web, preparations are underway for the Sun Dance, which finally takes places in the final chapter. I was intrigued with the idea of juxtaposing the chaos, suspicion and fear that comes with a murder against the peaceful preparations for the Sun Dance and the dance itself. So you had the idea of writing about the Sun Dance. Another idea had to do with the murder, right? You might call that the critical idea in a murder mystery! I'd read numerous true crime books and gotten hooked on the idea of sociopaths or psychopathswhatever you want to call themwho are unable to connect with other humans. Something vital is missing in their makeup. Since they don't care about anyone else, they're capable of doing enormous evil. They're very frightening, and they come in all flavors. They can look like the nicest people in the world. Think of Ted Bundy. I liked the idea of pitting Father John O'Malley, and Vicky Holden against someone like that, someone with no moral core. It struck me that Father John, as a counselor and a priest who hears confessions, would see into a sociopath more readily than someone like Vicky, who as a lawyer, will always think first of protecting her client's rights. I liked the fact that Father John and Vicky are on different sides in this novel. For the first time in their crime-solving careers. You have to shake things up a little with each book, I think. I don't ever want my characters to become too predictable. That would be a signal to end the series. You're not thinking about that, are you? As long as Father John and Vicky keep showing me something new and surprising me, I plan to keep them around. Any other idea that went into the mix for The Spider's Web? Yes, as a matter of fact. Just as I was starting to develop the plot, I became a crime victimor a potential victim. (Never let anyone tell you mystery writers lead dull lives!) Two burglars attempted to break into my home in the middle of the night while my husband and I were sleeping. They failed the first attempt, so the following weekend, they returned and tried again. A neighbor happened to spot what was going on, got their license and called the police. It turned out the would-be burglars were juveniles whose parents refused to cooperate with the police, not even allowing the police to speak with the kids. The mother of one insisted her son was simply a "prankster." So that was where it ended. Except that it was very unnerving to know that, for some bizarre reason, we had been targeted by two kids who were tried to break down our door. Naturally this experience had to go into the novel. Everything is grist for the writer's mill. Oh, and we now have a super-duper, high tech security system. A: Catherine McLeod will return in 2011. Then Father John and Vicky will walk across my computer screen for another adventure on the reservation.